For the team with a little reputed divine intervention, the San Diego Padres are your go-to franchise! 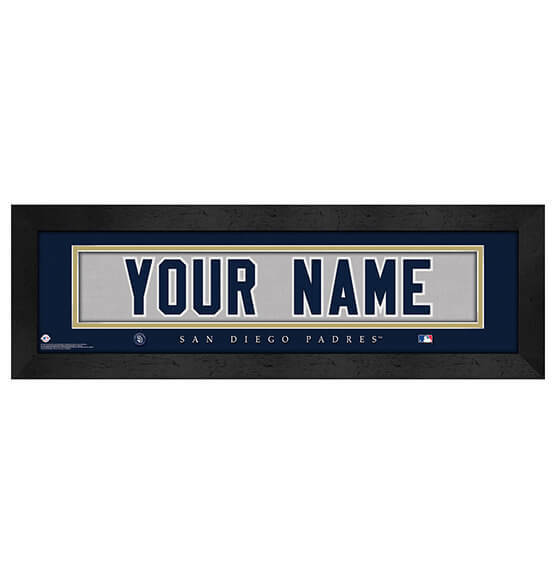 You can be part of this MLB baseball club, if only in name, when you purchase our San Diego Padres MLB Personalized Nameplate Framed Wall decor. Just let us know what name you want to be printed on this made-to-order custom sports decor up to 12 letters. We'll create a fantastic item that you'll be proud to hang in your home, office, garage or other fan cave location. This custom wall art looks great with its black frame, team colors and logo crisply printed on high-quality paper behind glass. Our Pads custom wall art comes ready to hang with a convenient sawtooth hanger.